Last week, I participated in #GA123 — one of the most cutting edge civic engagement events this election cycle. This “cross-platform” social media conference attracted over a hundred political leaders from the Southeast region including representatives from labor, progressives, civil rights, women, youth and people of color. Featured speakers included AFL-CIO Executive Council member and United Steel Workers’ International Vice President Fred Redmond, House Minority Leader for the Georgia General Assembly Stacey Abrams, League of United Latin American Citizens’ Director of Civic Engagement Sindy Benavides, Chairman of the African American Ministers in Action Reverend Timothy McDonald, III, and the Southern Region Director of the A. Philip Randolph Institute (APRI) Kermit Moore. This Southeastern APRI conference was the launch of a plan to unite and mobilize large numbers of white progressive and “voters of color” (VOC) through the use of “predictive modeling” to strategically micro-target supporters. What’s even more impressive? You could see #GA123’s impact with 200 tweets being reproduced 66 times — a high ratio and strong online activity for a conference of this size. What’s more, many in the audience were media personalities and local “influencers” with large followings, therefore #GA123 could have potentially touched over 120,000 people. The concept is simple, mobilize progressive voters to take three important steps: 1) Vote in the primary election, 2) early vote in the general election, and 3) get a friend to vote on November 4th. Impact on Election 2014: Conservative Tea Party candidates — like those running for Georgia U.S. Senate — rely on low voter turnout to win in off year elections. The majority of their vote comes from precincts where they have outsized support from older white male voters. Therefore, the only hope progressives have of holding on in the U.S. Senate, is with the help of a “Voters of Color Fire Wall.” This wall can be built in “States of Influence” – places like Arkansas, Georgia, Louisiana, and North Carolina that are not necessarily majority/minority but have enough diversity to effect the election. The question is- How does one ignite the “Rising Electorate” in a midterm? Background: “#GA123” Social media outreach has the potential to ignite Georgia’s progressive electorate in 2014. While fostering on-line collaborations in communities that share the same interests, the program could generate enthusiasm in communities that are at risk of high “drop-off” rates. The “sweet spot” is to engage local progressive organizations that are active offline and encourage them to be more active online and “visa versa.” Then involve these supporters in a push to get their on-line networks to vote and to be more active in long-term civic engagement work like holding elected leaders accountable. Case: Georgia is undergoing a remarkable demographic transformation and will soon be an electoral swing state. For these reasons, Georgia is at the center of the political universe as it relates to the “Rising Electorate.” As witnessed at the state level in 2012, this rising electorate helped to give President Obama 46% (1,773,827) of the Georgia’s vote – only a point off his 2008 performance. More importantly, the VOC vote share grew from 32% in 2008 to 37% for the first time ever. As a result, we now know that a Democrat can successfully win a bid for U.S. Senator with support from 35% of the progressive white vote. The Political Landscape: The 2010 midterm elections dealt the Democrats a sobering blow. Amidst a hyper partisan ad war, Democrats elected to keep the most valuable weapon in politics — the President of The United States — off the campaign trail. Consequently, they were not able to turnout enough voters to keep the political balance from tilting back to the right. 1. An estimated 2,576,037 million voters turned out in November of 2010 –a decrease of 1,316,845 votes from the 2008 election and 1,276,478 less than 2012. 2. Republican Governor Nathan Deal won with 53% of the vote. 3. The 8th Congressional district changed from Democrat to Republican by just 10,520 votes. 4. The GOP gained 2 seats in the state Senate and 9 seats in the state house. 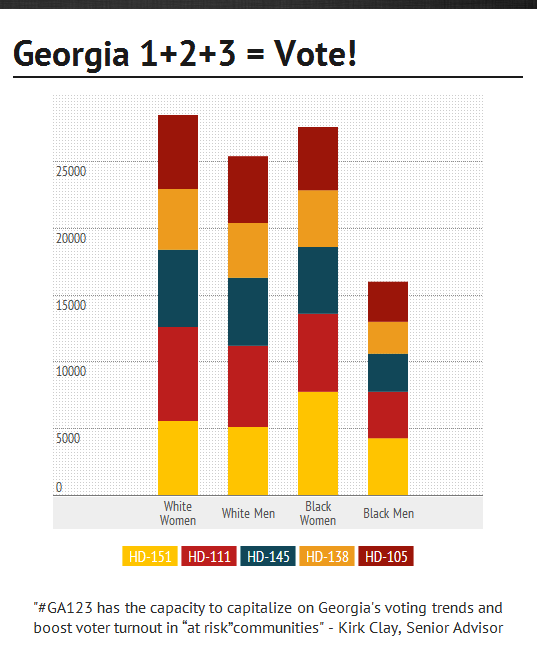 Voters of color make up 33% of Georgia’s registered voters (30% Black, 2% Latino, and 1% Asian). Georgia has over 850,000 Latino residents and 26% are eligible to vote. Nationally close to 52, 000 Latinos turn 18 every month and 9 out of 10 of those are eligible to vote. Latinos will account for 52% of Georgia’s new eligible voters in 2016. So what’s happening on the ground? We see progressive movement in areas like Georgia’s House District 111 (35% Black and 6% Latino with a significant youth population). This seat is in a county that gave President Obama 48% of the vote – just 2,925 votes from victory. Henry County has grown by 2.5% to 209,053 and cities like Stockbridge grew 2.5% to 26,281. Note that areas like this will have more than 14,000 “key” Voters of Color and could be decisive in 2014. Devoting resources to high performing VOC precincts here will give a tremendous return on investment. Wrap-up: Georgia is ready for a concentrated and multilevel campaign to train, equip, and energize their progressive community. The truth is that #GA123 has the capacity to capitalize on the voting trends listed above and boost voter turnout in “at risk” communities. The use of quantified impression-based targeting, demographic data, and technological enhancements will be a value added to traditional civic engagement tools. This will make it possible to narrow the gap between the number of eligible voters and the number of actual voters. If we can expand the electorate and provide enough momentum to energize voters for 2014 and the 2016 cycles, it won’t be long until the Democrats recapture, maintain, and extend the progressive legislative margins in this new battleground state. Reblogged this on Kirk Clay.